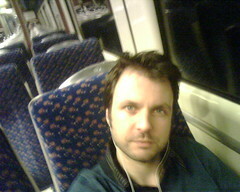 This is me on the train on the way home, having realised I forgot to take any pics while actually on the shoot. Darn. We had a good day, though extreme winds prevented us from working outside, which was a shame. We were in Haddiscoe, a pretty little village in South Norfolk, where someone has submitted plans to create a gravel pit within a stone’s throw of an old Church. The environmental impact would be severe. And you can read more about the content of the filming at the Cllr 2.0 blog. Our Clients March 13, 2008 Fruity video clip… and a nice testimonial! thanks, I went over to Haddiscoe this morning but the light was not nearly as good as last evening, took a few pics, but I think they will be flat. If we get some sun this weekend I will have another go.